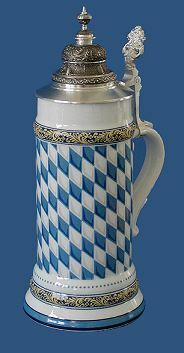 FOBSII offers +400 firstclass beersteins and mugs made in Bavaria, Germany. All steins and mugs are made from finest porcelain and glass ware in traditionary handwork. Our producer is "Porcelain and Glass Manufactory Kh. Zimmermann", famaous for finest beersteins. Our new design for this website is in work. Relaunch will come soon. To look for our steins please point your browser to our German webpage BAYERNKRUG.